What nursing education programs are approved by the Board? What are the requirements for simulation nursing faculty? What specific courses are required to be eligible to take the NCLEX-PN or NCLEX-RN Exam? Can I take the NCLEX-PN Exam if I have been a paramedic, Navy Corpsman or Air Force Medic? Will the Board help me with a problem in my school of nursing? Does the North Carolina Board of Nursing require a facility to accept additional clinical experience requests from new or existing programs? Does the North Carolina Board of Nursing (NCBON) promote other contact hour programs/continuing education courses in their materials or on the NCBON web site? What constitutes a clinical experience? North Carolina Board of Nursing approves only those leading to initial Registered Nurse or Licensed Practical Nurse licensure. The North Carolina Board of Nursing maintains a list of currently approved nursing education programs by law. This list is currently available on our web site under Programs in North Carolina. Applicants can link to the education institutions from our web site to obtain both contact information and requirements for the programs. The North Carolina Board of Nursing does not prescribe the simulation courses, number of continuing education hours, or certifications for lead faculty and lab personnel teaching in simulation education. Please contact your education and practice consultant for further questions. The North Carolina Board of Nursing approves and regulates pre-licensure nursing education programs in the State of North Carolina. 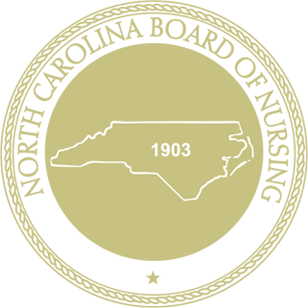 At this time, the Board does not approve nursing education programs which are outside of North Carolina jurisdiction, including out-of-state online programs/correspondence courses. For example, Excelsior College is approved by the New York State Board of Nursing and graduates from that program may apply to take the NCLEX-RN Examination in North Carolina and apply for licensure as a Registered Nurse in North Carolina. The North Carolina Board of Nursing encourages you contact out-of-state pre-licensure nursing education programs directly for information and specific questions about the program and the program's approval/accreditation status in their state. It is recommended that individuals research the approval/accreditation status and credibility of any nursing education program before enrolling in individual courses or the entire program of study. In addition, offers to prepare students to more easily pass specific programs should be discussed directly with the nursing program before enrollment. To be eligible to take the NCLEX-PN® examination, the student must have completed an approved program for educating practical nurses. The approved nursing program curriculum shall include biological, physical, social and behavioral sciences (21 NCAC 36 .0321 CURRICULUM). In addition, correlated theory and clinical practice shall have been completed in the following areas: nursing care of children; maternity nursing; nursing care of the aged; nursing care of adults; and nursing care of individuals with mental health problems. To be eligible to take the NCLEX-RN® examination, the student must have completed a Board approved professional nursing education program (associate degree program, baccalaureate degree program, or diploma program). North Carolina has no provision to allow challenge of the licensure examination based on alternate education and/or experience. The requirement is that one be a graduate of an approved practical nursing program to apply for licensure. If you have taken college courses or have health occupation experience, you could inquire at a local practical nursing education program to learn about transfer credit or advanced placement. The nursing education program may give credit for previous courses, but that is the decision of each nursing program. Military: The North Carolina Board of Nursing supports military personnel and veterans experiencing career transitions. Currently, the graduates of two military practical nursing programs meet North Carolina educational requirements for endorsement as Licensed Practical Nurse. These two programs are the only military nursing education programs that currently meet both the academic and practicum criteria required by the North Carolina Nursing Practice Act and Licensed Practical Nurse education standards. Graduates of all other U.S. Military Programs who have been licensed by examination in another jurisdiction should email the Endorsement Department using the Contact Us Form for specific requirements. The North Carolina Board of Nursing is interested in ensuring that nursing education programs are in compliance with Law and Rules in order to protect the public through safe nursing care. The Board will consider written and signed complaints about nursing education programs which reflect upon the quality of nursing education and addresses issues of non-compliance with education rules. However, the North Carolina Board of Nursing has no authority over school policies, grades, or conflicts between students and faculty. Each program is required to have processes in place for dealing with grievances and students and faculty are encouraged to follow appropriate procedure in the institution. Consult the nursing program handbook, college handbook, and student services for the proper procedure to follow. A nursing student who is in a clinical area as part of an approved nursing education program is working as an “unlicensed provider”. The authority to practice or “student status” is granted in The Nursing Practice Act Article 90-171.43 (2) License required. Note: A student is held to the same standard of care as any licensed nurse. Only the person named on the nursing license has the authority to practice nursing. The faculty member and/or preceptor is responsible for “appropriate supervision and delegation.” The law allows a licensed nurse to delegate certain nursing responsibilities to individuals who are competent to perform the assignment. Persons caring for the patient are responsible for knowing the boundaries of their role and for knowing if they have the knowledge/skills/abilities to provide for the client’s needs. It is up to each nurse to decide what activities can safely be assigned or delegated to another individual based upon the agency policies/procedures, the education/training of the individual, and the validated competency of the individual. When the nurse has delegated appropriately he/she is not accountable for the actions/errors of the individual assigned the task. It is the facility, not the North Carolina Board of Nursing, which determines when a facility is at the maximum capacity for additional clinical experience requests. There are many factors which must be considered for additional clinical requests. Factors such as staff and patient fatigue, the level of the student, any special projects/accreditation that a facility is undergoing, and the number of days/shifts students are already in the facility. A facility should only agree to provide clinical experiences when patient safety can be maintained. Adequate faculty availability for the students must be aligned with the learning objectives/outcomes for the course in which the student is enrolled for that semester. No. The North Carolina Board of Nursing (NCBON) is a regulatory agency whose mission is protection of the public. The NCBON includes information only related to the NCBON mission, or NCBON sponsored programs. Nursing is a practice profession and requires clinical practice with “hands-on” clinical experiences, in order for nursing students to become proficient with integrating nursing knowledge and skills. Clinical experiences need to be designed based on the learning objective/outcomes for the course in which the student is enrolled, and need to provide adequate time for the student to apply theory concepts learned to patient care situations. The nursing program’s advisory committee can provide some guidance for the program related to the performance expectations for new graduates. While the North Carolina Board of Nursing does not specify percentages or hours for clinical experiences, the expectation is that students will have adequate clinical time throughout the program to apply concepts learned in class to patient care experiences in a clinical setting. “One strength of U.S. nursing education is that students work directly with patients and the health care team” (p.12). “As students progress through their programs, they are given ever increasing responsibilities in clinical situations” (p.12). “Nursing, like all practice disciplines, relies on situated cognition and action” (p.13). “…today’s practitioner must be able to draw on all they learn in each of the professional apprenticeships (cognitive, skilled know-how ethical comportment) and integrate them in practice” (p.29). “At the heart of learning in any practice discipline…lies the need for situated cognition (Lave & Wenger, 1991), or the chance to think in particular clinical situations” (p.30). “Clinical reasoning is the ability to reason about a clinical situation as it unfolds, as well as about patient and family concerns and context” (p.46). The North Carolina Board of Nursing supports innovative strategies in nursing programs. In order to assure that the nursing program curriculum meets the North Carolina Board of Nursing Education Rules governing Nursing Education Programs, any innovative teaching strategies for nursing education must be reviewed by a North Carolina Board of Nursing Consultant, and may receive Board notification and/or approval prior to implementation. The proposed innovation must include evidence and/or best practice information in the supporting documentation. The assigned program consultant is available to respond to questions related to nursing program innovations.